This "Historically Speaking" column was published by the Exeter News-Letter on July 29, 2016. Maybe they talked about Abraham Lincoln. In the summer of 1915, three men – Ambrose Swasey, Daniel Chester French and Henry Bacon – made a visit to Exeter, New Hampshire. Swasey and French were both born in Exeter and may have known each other as boys. Both had made their fortunes elsewhere, Swasey as an engineer and French as a world renowned sculptor. They knew Exeter well and on this trip they seemed to be planning something – looking over locations and beauty spots – to the puzzlement of local people. Henry Bacon, an architect, had no ties to the town but was a friend and collaborator of French. For the previous 17 years he’d been consumed with one project – the creation of a great Greek temple dedicated to the memory of Abraham Lincoln. His single-mindedness had broken up his partnership with James Bright. Bright had been the financial administrator of the firm and Bacon’s often unpaid time devoted to the project had caused the rift. By 1915, the Lincoln Memorial was finally under construction and Bacon was able to focus on other projects. Yet here he was, standing in the square in Exeter, New Hampshire, directly in front of the Exeter town hall where Lincoln had addressed the town in 1860. French had been a boy of 10 and Swasey was 14 when Lincoln arrived. French may have missed the event, his family was preparing to move away from town, but Swasey and his brother Eben memorably set a bonfire alight at the family homestead on Newfields Road to mark the event. The fire department had to be called to save the farm. Also at the Lincoln speech was the Exeter Brass Band, at that time called the Exeter Coronet Band. James Prescott would later recall, “The Exeter Band was trying to ‘blow’ out in front of the Town Hall. Robert Atkins and I got up on the steps and listened. Pretty soon the band went around the building and in the back door, and blew some more inside.” The band had been organized in 1847, and was frequently called upon to play at town events and particularly political rallies. The three men – the engineer, the sculptor and the architect – were planning something for Exeter. Swasey, who still spent summers in town, wanted to give his hometown a gift. Something monumental, but practical. He’d already donated money to his church and would later pay for the beautiful Swasey Parkway that is beloved by Exeter residents to this day. In 1915, he decided the town needed a bandstand. There had, of course, been a bandstand in the center of town. In the 1890s, a wooden bandstand was erected to hold summer concerts. By 1902, however, the Exeter News-Letter reported that it was in poor repair and was slated to be removed. 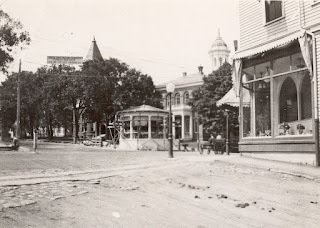 “In the square the stand constantly threatened accident, but was too long tolerated for the pleasure derived from midsummer concerts.” The bandstand was moved to the commons on Park Street, where it suffered from vandalism and neglect. It was later sold and moved again, leaving the band with no fixed place to perform. 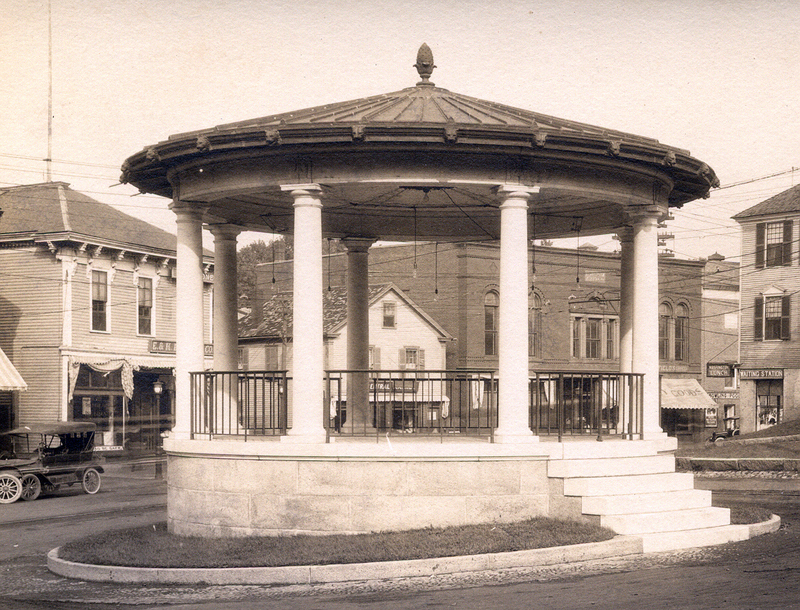 Swasey’s permanent bandstand, announced in early 1916, would be an ornament in the town. The town accepted Ambrose Swasey’s generous offer. Henry Bacon set about designing an architectural gem worthy of a town that had hosted his idol, Abraham Lincoln. Whether French contributed any flourishes is unknown. He and Bacon were toiling away on the Lincoln Memorial project – French having been awarded the commission to sculpt the mammoth seated Lincoln. One thing is certain, the bandstand, officially known as the Swasey Pavilion, was far more ornate and elegant than any Exeter resident had expected. The bandstand was built in the summer of 1916 at lightning speed. Ground was broken in May and it was ready for dedication in mid-August. The Norcross Brothers Company of Worcester served as the contractors, building the bandstand with modern construction – steel trusses and concrete form the base – and old-world style design. Pink granite with marble flooring creates the base of the bandstand, which is roofed with copper. Looking at it from the outside it is beautiful, but to really appreciate the design one has to step inside. From there the mosaic ceiling and floor can be viewed closely. The ornamental electric light chandelier has to be seen to be fully appreciated. In the center of the floor is a bronze plate with compass bearings and the zodiac – homage to Ambrose Swasey’s work with telescopes. A pine cone finial stands at attention on the peak of the roof, which has 16 lion’s head gargoyles to discharge rain water. Other towns may have bandstands, but Exeter has a temple. The dedication was held on August 10th, 1916 – a day later than planned due to rain. Ambrose Swasey was there to hand over the symbolic keys to the Town of Exeter (no key is needed to visit the bandstand – it is accessible to the public at all times). A few speeches were made; there was polite applause and a bit of jovial horseplay. Finally the Exeter Brass Band took the stand for the first summer concert of 1916. As war was overtaking Europe, the first piece of music played on the Swasey Pavilion was a march called “International Peace.” From her home on Pine Street half a mile away, Helen Tufts wrote in her diary, “dedication of Pavilion going on. I can hear band.” Somewhere Abraham Lincoln was smiling. Swasey Pavilion under construction during the summer of 1916. From a snapshot taken by an employee of Exeter Hampton Electric. Swasey Pavilion shortly after its dedication on August 10, 1916. Off to the Convention! Rally Round the Candidate!